This was a volunteer project for a nonprofit event here in Sonoma County. Bunfest is a free, daylong event featuring speakers and vendors, all geared toward educating the public about how to have a healthy, happy house rabbit — and providing fun supplies and toys as well! I wanted to take this opportunity to learn a new skill, so I built this site with Jekyll and deployed it on GitHub Pages. (Both of those tools are free, which is a bonus for a nonprofit event!) Jekyll was really fun to use, so I’ll definitely keep it in mind for future very simple projects that don’t require a fancy user interface for the client. The design stems heavily from a free template, but I tweaked it heavily to suit our needs. 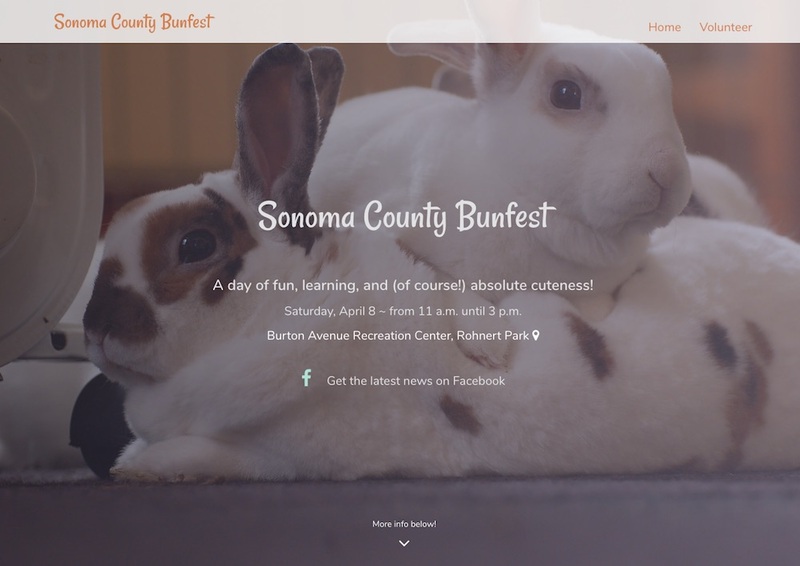 As I publish this post, we’re gearing up for Bunfest 2018, so the site should be seeing some more updates soon!